The Dons claimed pre-season bragging rights as they beat Sheffield Eagles 22-18 to lift the South Yorkshire Cup at the Keepmoat Stadium. After a tight first half, Doncaster surged into a 22-4 lead before a late rally from the Eagles, who ultimately came up just short. It was the visitors who drew first blood after five minutes when winger Garry Lo touched down on the left. The next 15 minutes saw very little in terms of scoring opportunities. The Eagles looked to have scored but were pulled up for a forward pass. Doncaster got their own chance to score on 35 minutes when they intercepted a pass 20 metres from their own line. Kicking upfield, they chased it down but only managed a scrum 20 metres from the Sheffield line. But they did level on 38 minutes when Corey Hanson managed to squeeze through the Eagles defence. Jack Miller then converted to give the Dons a 6-4 lead at half time. Doncaster got off to a flying start in the second half thanks to Sam Doherty who scored on the right hand side, with the conversion missed. The Dons managed to get their second try of the half on 48 minutes when Richie Barnett found a looping pass to touch down in the left hand corner, Jordan Howden converting. The Dons opened up a commanding lead by the hour mark when Kieran Cross dived over the line while Tom Carr added the conversion. The Eagles managed to get their first points of the second half in the 67th minute when Lo went over for his second try of the game with Simon Brown’s conversion falling short. 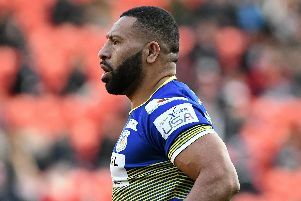 Sheffield continued their attempted fight back when centre Menzie Yere ran through with Brown converting narrow the gap to eight. But their next score would not come until two minutes from time when Will Hope squeezed through to give them a glimmer of hope. But a missed conversion kept them four points shy as the hooter sounded. Dons: Sheriff, Jones Bishop, Doherty, Heil, Barnett, Howden, Miller, Scott, Kesik, Spiers, Martin, Miranda, Thackray. Eagles: Blackmore, Lo, Yere, Thompson, Millar, Brown, Minchella, Wheeldon, Fozzard, Mexico, James, Straugher, Hope. Star man: Charlie Martin (Dons).